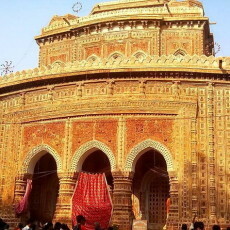 Kantajew Temple or Kantaji Temple is one of the important Hindu Temples in Bangladesh. Also known as Kantanagar Temple, this late medieval shrine is located at Kantanagar in Dinajpur district in Northern Rangpur. 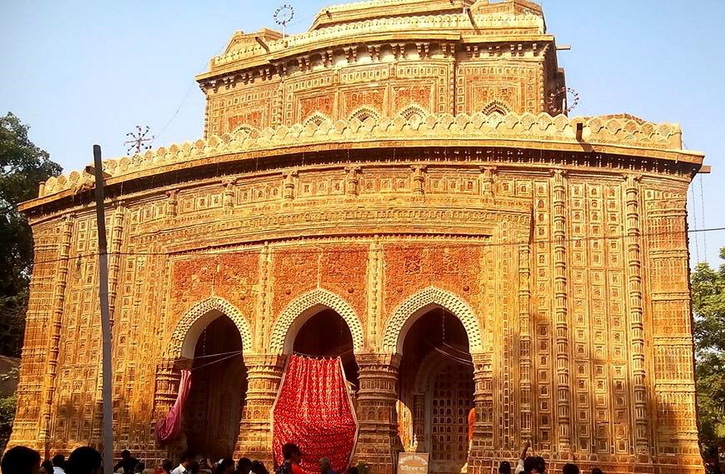 Kantajew Temple is dedicated to Lord Krishna (known as Kanta in Bangladesh) and Rukmini. The temple is also known as Navaratna Krishna Temple. The construction of Kantanagar Temple was started by Maharaja Pran Nath in 1704 CE and the temple was completed in 1722 CE during the reign of his son Maharaja Ramnath. The original temple was constructed in Navaratna (nine-spired) style architecture. However, the temple got lots of damages during the earthquake in 1897. The temple is noted for its thousands of beautifully decorated terracotta paintings making it one of the most impressive Hindu monuments in Bangladesh. Kantaji Temple is 21 km north of Dinajpur town and around 2 km west of Dinajpur – Thakurgaon Highway across the Dhepa River.